Happy Thanksgiving! On this day of gratitude, I reflect back on how blessed I've been to have been able to visit the Happiest Place on Earth time and time again, with great friends, and on great occasions. On the morning of March 1st, following the conclusion of One More Disney Day, I found myself at the front of the park, just before leaving, gazing at the beautiful, warm morning light, glowing on the Main Street Station, symbolizing another new beginning... a new day... another chance for magic and memories to last a lifetime for thousands of guests that would soon be entering. For some, Disneyland is a once in a lifetime trip. For many others, it is a rarity--something long anticipated and deeply cherished. And for me, it is something I've been fortunate enough to be able to visit regularly. That is certainly a privilege, not a right, and I am thankful for the ability to continue to do so. 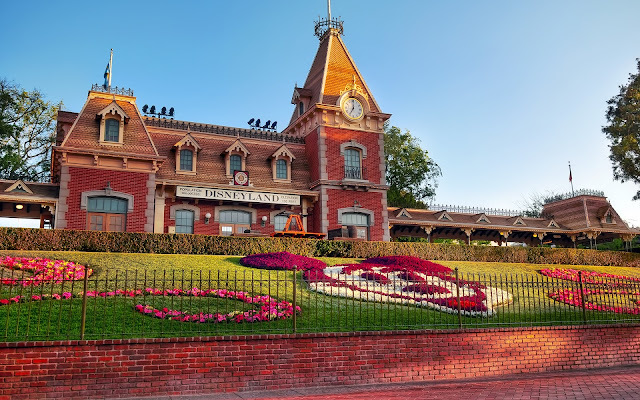 The Disneyland Railroad Main Street Station on the morning after Leap Day.